Ronan Doherty is understood to have been suspended by Institute Football Club amid betting allegations. INSTITUTE midfielder, Ronan Doherty is understood to be the player at the centre of an Irish Football Association investigation into an alleged breach of the association's strict gambling rules. The club issued a statement this week confirming the authenticity of a screenshot that circulated on social media which showed the player asking a friend to place a bet on Ballymena United to beat Institute on Saturday, February 9th - a match 'Stute lost 2-1. Under strict IFA rules a player cannot bet on any team - including his own - in any tournament or league in which that player’s team competes. While 'Stute Chairman, Mr Anderson refused to name the player in question, it's understood talented midfielder, Doherty has since been suspended and the club has pledged to work with both Northern Ireland Football League and the IFA to determine what further action should be taken. The player apparently reaffirmed his commitment to the club and has apologised to the Chairman and the 'Stute supporters. He is reported to have said: "I know it was stupid but I didn't go out to lose that game, in fact I actually got man of the match that day. "I have learned a hard lesson and I'm sorry to have created this problem for the club and the other players. 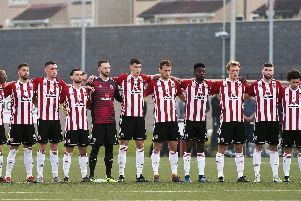 I will accept whatever punishment comes my way and then do my utmost to restore the club's faith in me,"
Doherty, who joined 'Stute this summer from Ulster Senior League side Cockhill Celtic, has a been revelation this season. The 23-year-old's has scored two goals this season and his all round game has earned him rave reviews from a host of Danske Bank Premiership manager's, with Dungannon Swifts' boss Kris Lindsay stating he was the 'best player on the pitch, by a country mile', during Saturday's clash at the Ryan McBride Brandywell Stadium. In fact his first league goal of the season at Ards a few weeks ago will be a leading contender of February's Goal of the month.